Play 102 four bar vocal phrases, sung by VEELA, in real time on your keyboard or from the Piano roll, in whatever pitch, chords or tempo you like. Drag and drop any of the 102 pitch flattened source vocal samples on to 25 special Harmor presets. These include other playable effects, such as robotic vocoding, sustained pad sounds or mutated formants, giving more than 2500 possible combinations. Learn more about Veela on her Power Users page here. 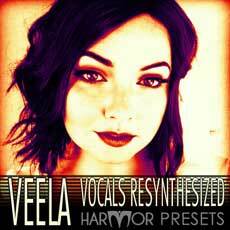 Veela is also available for session vocal work. Please contact her through her social media.